I am wearing my costume. 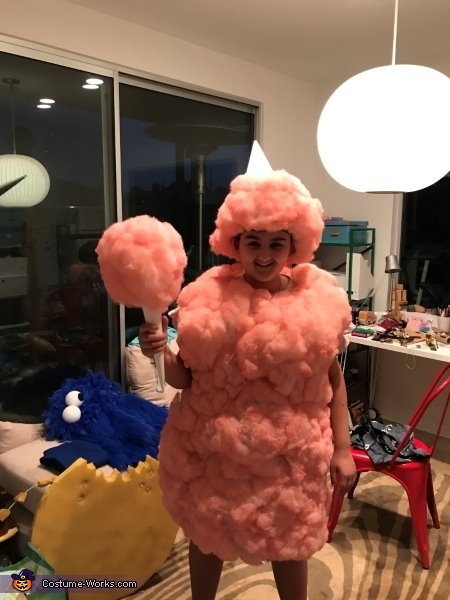 The costume idea came because I wanted to be something recognizable, unique, fun and sweet. My costume also lights up. First we took a dress Then we sewed lights onto it so I could light up. Can we spray painted the fluff ballet slipper pink, then let it dry. Then spray glued it on to the dress. Then I got a wig cap and spray glued the same fluff onto it. I took a poster board and made it into a cone. I hot glued the cone on to the wig So it is like a cotton candy on a cut o I took a poster board and made it into a cone. I hot glued the cone on to the wig cap so it is like a cotton candy on a cone.